Before the Fall of the Wall in 1989, Germany was composed of two different parts: East and West–separated by the Berlin Wall that divided the country and the City. I had visited Germany for the first time in 1987 but had only stayed in West Germnay. 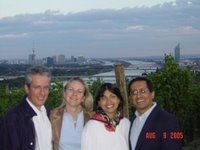 By 2009, when next I visited 22 years later, the country had been unified and I visited East Germany for the first time. I loved Berlin–an endlessly fascinating city that spanned many historical periods that was reflected in its varying architecture. Follow me on my walking tour of Berlin. Berlin, in the heart of a January winter, can be brutal. But layers of warm cashmere and sheepskin-lined Uggs allowed me to walk along the city’s sidewalks into the pages of history. All modern-day activity is concentrated around the Zoo, best reached by public bus Number 100 that offers, through its picture windows on the upper deck, a built-in tour of the city, for the price of a ride, no matter where you board it,. It trundles along the administrative quarter of the Reichstag, Berlin’s Parliament Building, the many museums of the Kulturforum and upscale showrooms offering retail therapy at Ku-damm (short for Kurfunstendamm). But Berlin is best discovered on foot; so comfortable shoes are vital to an enjoyment of its offerings. It helps to remember that the city was once divided into two parts: East Berlin and West Berlin–by a Wall (the Fall of which we are celebrating today, twenty years after it momentously crumbled). Though history has rendered that divide merely a current curiosity, there is enough difference between the two parts easily discernible by even the laziest eye to suggest that a massive ideological difference once characterized the segregation. Tuck a warm scarf around your neck, bury your gloved hands deep in the pockets of a winter coat and begin your jaunt at the oft-photographed Brandenburg Gate. Prepare to be jolted by your first sight of the city’s most easily recognizable landmark. Emerging from the Underground train on to Unter der Linden, one of the main arteries of the East (so-called because it is lined by linden or lime trees). Time permitting, stroll along this road that was built by the Prussian monarchs to lead directly to their city palace. You will, most likely see the Gate right ahead of you. Do not be surprised if you stifle a gasp. Seen in countless photographs and films, you will find it familiar yet foreign and as it suddenly loomed ahead of me, its presence was so startling that I experienced a reaction similar to the kind I had when first I saw the Taj Mahal and the Grand Canyon. It really did take my breath away! The Brandenburg Gate was built by Karl Gotthard Langhans from 1788 to 1791 under a commission from King Frederick William II of Prussia. Twelve Doric columns support a Quadriga, a chariot drawn by four horses and Victoria, Roman goddess of Victory, sculpted by Johann Gottfried Schadow.Anyone who has been to Athens, will recognize it easily as being based on the Prophylaea, the entrance to the Acropolis in Athens. The Nazis used the gate as a party symbol. Though it suffered extensive damage during the bombing of World War II, its structure retained its integrity standing tall amidst the ruins of the Paritzer Platz which surrounds it. As you take in the Neo-Classical lines of this landmark, let your eyes stray towards the Adlon Kempinski Hotel, one of the world’s most luxurious buildings that gained recent notoriety from the fact that the late Michael Jackson dangled his baby from a third floor balcony of this stately building only a few years ago. He wasn’t called Wacko Jacko for nothing! Your next stop would be the Reischstag—the country’s Parliament Building, where the Bundestag, i.e. Parliament, meets. This 1894 structure hosted the German Parliament until 1933 when it was burned down. A recent restoration has returned it to its former glory and crowned it with a glass dome, the handiwork of British architect Sir Norman Foster. Those familiar with the collapsed glass pudding that is the City Hall building on London’s South Bank will see similarities in Foster’s style with Chinese-American architect I.M. Pei who also uses glass liberally in his creations (remember the Pyramid in the central square of the Louvre in Paris?). It is worth joining the queue to see Parliament in session as well as to climb the spiral walkway to the very top of the Dome that offers multiple reflections in its mirrored walls as well as lovely views of the City astride both banks of the River Spree. Make a right, and go past the Brandenburg Gate to arrive at the general area known as Hitler’s Bunker. Most visitors remain excited about this spot imagining that there still exists a secret passageway leading to the underground headquarters in which the Fuhrer remained holed up with Eva Braun as the war came to a suicidal end (in much the same way that the Underground Cabinet War Rooms and Churchill Museum in London are open to visitors). Do not be disappointed to discover that the bunker was completely destroyed by the Soviets after they seized control of the city at the war’s end. This was deliberately done to prevent Hitler’s grave from becoming a pilgrimage site for the world’s Neo-Nazis. Today, nothing but soil stands over the warren of rooms once occupied by the most powerful SS officers. They are surrounded by the kind of solid, squat, grey, institutional residential buildings that characterize all Communist countries. Residents of these building today use the land under which the bunker once lay to walk their dogs who defecate all over the premises—what some would consider a fitting fate for the architects of the hated Regime. A few feet ahead is the Holocaust Memorial. You will be struck by the stark simplicity of the area that is composed of hundreds of granite blocks of varying height shooting upwards to form a uniform grid comprising narrow lanes. You realize, soon enough, that this concrete maze, can be terrifying. Every side you turn, more monotonous concrete blocks entrap. Finding the steps that lead underground is a palpable relief. This museum, a serene darkened space, details the losses suffered by six European Jewish families during the insanity of the Holocaust. This is a good first stop for anyone contemplating a visit to the Sachsenhausen Concentration Camp which lies just a few miles outside Berlin. Though not as well known as the ones at Auschwitz or Dachau, it was no less sinister as the ruthlessness of Nazi machinery rounded up Jews and other unwanted members of European society, herded them off to face forced labor under atrocious conditions and eventually gassed them to death. To see this chapter of history presented so vividly through photographs, diary jottings and postcards in this museum is so heart breaking that you might find yourself suppressing tears. Not too far away is a huge grey granite building on the intersection of two of East Berlin’s busiest roads—Wilhelmstrasse and Fredreichstrasse. This building has the appearance of the kind you see in Nazi movies such as the recent Valkyrie that was shot on location there—dour, forbidding, depressing. This is the only one of the old Nazi buildings that the Soviets did not destroy after they took control of Berlin. It used to be the Ministry of Ministries under the SS but today is the Ministry of Finance and Taxation—just as frightful, some would say! At the intersection of the street on which this scary building ends are the remains of the Berlin Wall that once encircled the city and separated the GDR (German Democratic Republic, the West) from the DDR (the Communist East). Tourists pause here today to take pictures and stand astride it, one foot in East Berlin, the other in the West. Built after the takeover of the city by the Communists who wished to deter escapees from moving surreptitiously from the East to the West, it encircled the city and became a somber symbol of the suppression of freedom. The Wall today is a grey granite structure devoid of graffiti and enclosed by a fence as tourists still attempt to break pieces of it to sell on E-Bay! Checkpoint Charlie is just around the corner from this remnant of the wall. This was the code name for the Border Crossing between East and West Germany. The name is derived from the Code used in the NATO phonetic alphabet at the time—A for Alpha, the check-point at Helmstedt, B for Bravo at Dreilinden and C for Charlie in Berlin. It refers to a nondescript white shed manned by Allied guards during the Cold War. To leave this last checkpoint in the American sector behind was to enter into the Communist Bloc in East Berlin, a place as different before the Fall of the Wall as Heaven from Hell– which explains why so many hundreds of East Berliners risked death attempting to cross it! Their experiences are well documented in the Checkpoint Charlie Museum set up a mere block away. Just next door is a Soviet Museum that carries the last Soviet flag flown on the Russian side before the Wall collapsed in November 1989. The atmosphere in this part of Berlin, even today, 65 years after the war ended, is grim, and though tourists pose for pictures, there is a reverential silence that engulfs the area. Though your appetite might have suffered by this mental bombardment, it would make sense to stop at this point for apfel streudel and hot chocolate. Traffic flows peacefully today in the many broad streets and avenues and there is little to suggest that life was once so fraught with emotional hardships for families split on both sides of the divide. While a walking tour of 20th century Berlin can leave the visitor rather respondent, the city offers other far more mood-uplifting quarters, many of which were built in the 18th century. It is helpful to keep in mind as you cover the erstwhile royal portions of the city that most Prussian kings were called Fredriech or Wilhelm and when their parents were being particularly creative, they were named Fredreich Wilhem! The Gendarmenmarkt (literally, in French, the Policeman’s Market), a good place to begin such an exploration, is dominated by three stunningly beautiful buildings—the Concert Hall, the Hugenot Memorial Museum and a Protestant Cathedral. In the center of one of the grandest and prettiest squares in Europe, German playwright Schiller contemplates the vagaries of history from his marble pedestal while surrounded by the Muses. One block away, your route will wind towards Unter der Linden and on to Bebelplatz which is also dominated by the colossal dome of a church—the Catholic Cathedral of St. Helwig decorated with striking sculpture in bas relief on its main pediment. This space overlooks the campus of Humboldt University whose alumni list reads like a Who’s Who of German intelligentsia from Albert Einstein and Franz Kafka to Sigmund Freud and Bismarck, Karl Marx and Fredreich Engels! In fact, in the early-19th century, a book burning ritual was carried out by a dictatorial regime that led alumnus Heinrich Heinne to write in the 1820s that once a society starts to burn books, it will not be long before it burns people. Strangely prophetic, considering what the Nazis did a century later. Because the university is allegedly ashamed of its role in the book burning scandal, today books are sold by the main gate, the proceeds going to charity. If you make a left out of the University gates, and head further along Unter der Linden, you arrive at Museum Island, location of the Lustgarten with the Altes Museum, a splendid Neo-Classical structure that houses Greek and Roman Antiquities and is considered one of the finest such buildings in Europe. Its most treasured item is a bust of Egyptian Queen Nefertiti, a study in haughtiness. Just past the Altes Museum, you will cross the ornate bridge over the River Spree and stop short at the sight of the superb Berliner Dom or main Cathedral which is reminiscent of London’s St. Paul’s Cathedral and for good reason—the Kaiser wanted a cathedral similar to St. Paul’s, only more ornate–and so the architect gave him his heart’s desire piling on every possible sort of exterior ornamentation that money could buy! Inside, the Berliner Dom is an epic to Baroque excess. Marvelous stained glass windows, marble Corinthian columns, carved apostles surrounding an ornate altar, lavish gilding, a magnificent brass organ with an intricately carved case and the grand sarcogphagi of Freidreich I and his wife make this one of the most staggering ecclesiastical spaces in the city. Of the many beautiful churches that dot the capital—from the Baroque to the Modernist—there are two that most visitors choose to see: First, the Kaiser Wilhelm Gestadtkirsche whose profile with its bombed steeple is striking even from a distance. Because it is so intriguing, it warrants investigation. Visitors enter the Memorial Hall that used to be the main entrance to the original church that has stood on this site since 1904 when it was inaugurated by the Kaiser. During World War II, it was bombed to smithereens though its tower remained, a ghastly reminder of happier times. The church, however, boasted some unimaginably intricate mosaics in the Byzantine style, many of which miraculously survived the bombing. When the war ended and the reconstruction of Germany began, it was decided that the tower should be retained though the rest of the ruins were demolished. The surviving mosaics were carefully moved and relocated to the main tower together with several others that had originally stood there. Today, these mosaics are the main attraction of the tower that has been converted into a Memorial Hall. A newer, far more modern church (that some think resembles a compactor! ), was fashioned out of thousands of pieces of sapphire blue glass that glow as the sunlight streams through them. It makes for a quiet place of contemplation. The other church, also frequently visited is Marienkirsche, a Gothic Church with an ancient fresco that wraps itself around the entrance walls. This, however, is so faint that it is barely discernible. Inside the church, the stained glass windows on the altar are striking as are some very old sculpted effigies. The steeple of this church seems to reach out for the skies, competing, as it were, with the Berlin Telecom Tower whose spire also seems to scoop up the clouds. No first time visitor can leave Berlin without being struck by its wealth of art and architectural artifacts. 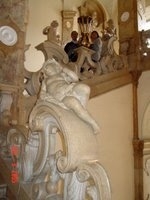 To see all the museums of Berlin one would need a month and to appreciate them from the outside would require another! Each building is stunning and forms a very fitting receptacle for the collection that lies concealed within. Two museums that one would be loathe to leave out are The Gemaldegalerie at the Kulturforum and the Pergammon Museum. The Kulturforum is a part of Berlin in which the arts and culture are omnipresent through the Philharmonic Building, the National Library and, of course, the Museum of Fine Arts, the Gemaldegalerie. Berlin boasts so heavenly a collection of paintings as to make art-lover feels as if they have reached the Gates of Paradise. The Nazis were huge supporters of culture and patronized their artists enthusiastically. Hence, they amassed a vast treasure trove of fine art by the Old Masters. When the War ended, this collection was divided between East and West Germany, its reunification becoming possible only by the Fall of the Wall. The new Gemaldegalerie, created to house this treasure, is a Modernist space custom designed and built specifically for the purpose—and it is truly one of the finest museum buildings to be seen. It boasts an interesting layout, and paintings hung against light-absorbing walls so that daylight makes only a subdued presence felt on the canvases that suffer no artificial light upon their surfaces at all. As for the collection? Well, most visitors give themselves two to three hours to see the Highlights (the museum has a fine handout highlighting 20 items) but one can easily spend the entire day here. The clutch of Botticellis is astounding, there is a fine array of Rembrandts, some really superb works from the Dutch and Flemish Schools, a totally wacky Pieter Breughel canvas entitled A Hundred Proverbs and easily the most striking one of all–Caravaggio’s Cupid Victorius. In fact, Cupid’s playfulness, indeed his impishness—as caught by his pose and his expression—are so entrancing that it is hard to tear oneself away from this work. And a Vermeer entitled A Glass of Wine is also so memorable that it brings to mind the novel Girl with a Pearl Ear Ring by Tracy Chevalier. Sustenance may be found in the Museum Café that allows visitors to sample a variety of delicious German salads as well as hearty main meals. If the Gemaldegalerie presents high quality fine art, probably the piece de resistance among Berlin’s museums is the Pergammonmuseum, located on what is called Museum Island. Audio Guides in English provide a very comprehensive commentary on the Museum’s Highlights. The very first ‘room’ in the Pergammon is breathtaking. As soon as you walk in, you find yourself standing right in front of the altar from the Greek Temple at Pergammon in modern-day Turkey—it is from this Temple that the Museum gets its name. Now, though the history of the museum is long and fascinating, suffice it to note that in the early part of the 19th century, German archeologists were exceptionally active in sites all over the Middle East. A great deal of their excavations and discoveries led to the uncovering of ancient civilizations whose mementoes would have been lost to the world. As a reward for their endeavors, they were permitted to bring these ‘structures’ to Germany where these specially constructed museums served to house them safe from the destruction that could be wrought by the elements. The Pergammon Altar has sculpture that is in a far better state of preservation than the Elgin Marbles in the British Museum (although those are far more famous—perhaps because they are so controversial!). Apart from the marble altar which is intact and which the visitor can actually ascend (a truly unique experience), colossal friezes from the Pergammon Temple decorate the walls. The heights of the altar make a superb vantage point from which to contemplate the wealth of ancient mythological sculpture that encompasses you. This is so magical, that it is worth going to Berlin only to be swaddled by this spectacle. The Temple of Athena in the next room is just as dazzling. What is mind blowing is the sheer size of these works and the scale of the rooms that allow these towering temples, columns and altars to be accommodated indoors! And I hadn’t yet arrived at the Ishtar Gate! Next door to the Athena Temple are the Gates of Miletus, colossal Classical columns holding a decorative gateway that once existed at the entrance to the Market in Miletus in Asia Minor. Though badly damaged and undergoing restoration, these gates are truly splendid. Here, too, visitors walk right through the gates, feeling as if they have actually arrived in these ancient worlds. And then you reach the most impressive exhibit of all—the Babylonian Ishtar Gates. These stunning gates composed almost entirely of sapphire ceramic glazed bricks were built during the reign of Babylonian king Nebuchadnezzar (604-542 BC). To reach them, one needed to pass through what was known as the ‘Processional Way’—originally 590 feet long. In the Pergammon, the Inner Gates and a large part of the Processional Way allow the viewer to marvel at the quality of the artistry that went into the design and construction of so exquisite a work. Although many of the upper parts of the structure have been restored (it is very easy to see where the original tiles end and the modern ones begin), the animals that adorn the walls (horses, ibex, and lions—loads of lions) are original. These are not merely embedded into the walls but jut out like bas relief—all of which makes them not just impossible to describe but impossible to stop raving over. Other more significant parts of the Pergammon’s collection are the Façade of the Mshatta Palace which once stood in Jordan—the parts in the museum once concealed the entrance to a palace and a small mosque. The Allepo Zimmer, a spectacular paneled room that came from a merchant’s home in the Syrian city of Aleppo, is also fascinating. Apart from its obvious treasures, one of the most exquisite objects in this collection is a Roman Sarcophagus of the 2nd century AD upon which is carved the entire chilling story of Medea—truly Hell hath no fury like a woman scorned! The second floor of the Pergammon building stocks treasures of the Islamic world (including a few fascinating Moghul works), but easily the most striking is the glazed ceramic tiled Mihrab from a mosque in Kashan (in modern-day Iran) built in 1226. The quality of the glaze is so superior that the gates glitter as if covered in gold—again, impossible to describe! Though it is located rather remotely compared to most of the city’s other attractions, no trip to Berlin would be complete without a visit to the Jewish Historic Museum. This quite recent addition to the city skyline is the design of American Jewish architect Daniel Libeskind who has created a structure inspired by the Star of David turned inside-out. To call it sheer genius would be an understatement. It is so superbly conceived and so amazingly implemented that I marveled at Libeskind’s vision with each step I took further and further into the maze-like building. In the basement is the Holocaust Tower—a structure which represents various things to various people. It is a tall column that you enter underground. You will find yourself in an unlit and unheated space (and believe me, the contrast in temperatures is striking at any time of year). The only light is natural—coming from a small slit in the walls. It represents the imprisonment of the prisoners in the various concentration camps around Europe and their surmounting hopelessness. I then stepped into the Garden of Exile, a series of granite columns with olive trees growing at the top—olives, of course, symbolizing the Promised Land. Taking the elevator to the top floor, I got off in the Medieval section which details the persecutions that Jews encountered throughout history. In a capital city that, like others in Europe, is fast becoming internationalized, it is good to know that foodies can still find treats that are essentially indigenous. KaDeWe (short for Kaufhaus des Westens), the magnificent Art Deco mansion to Mamon built in 1907 by Berlin merchant Adolf Jandorf is a must-eat venue. It’s Gourmet Floor rivals that of London’s Harrods boasting 3,400 wines and 1,300 kinds of cheese alone. If you are a connoisseur of all things edible, you cannot possibly be disappointed for it is not only the taste of the items you will purchase but their presentation that will have you composing symphonies to your taste buds. Berlin also has a selection of restaurants to suit every pocket and palate but you would be well advised to try some national specialties such as wild boar casserole with knoddel (potato casserole) and veal roast with spaztel (a German thick pasta, somewhat similar to gnocchi). German potato salad is world renowned and the country makes wurst (sausages) with the same attention to detail that France makes cheese or Belgium makes chocolate. 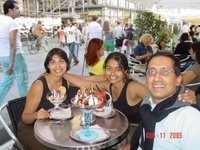 As for Chocoholics, nirvana is promised at Fassbender and Rausch near the Gendarmenmarkt. This upscale chocolatier has picture windows that display chocolate replicas of the Brandenburg Gate, the Kaiser Wilheim Gedatschkirsch and, somewhat inexplicably, the Titanic! When you have admired the craftsmanship that has created these confections, you can agonize for hours as you gaze at a selection of choicest treats from individually molded pralines and hand-rolled truffles to take home in a signature box. Then climb a floor higher to the restaurant, settle by a window that overlooks the imposing dome of the Cathedral and order a Black Forest Chocolate pastry (I love the name in German—Schwartzwalden Torte!) Cherries, soaked in kirsche (cherry liqueur) are frozen into the sponge. They thaw into minscule shots with each chocolately bite! Heavenly! Berlin, will no doubt, have awed and moved you in turn as you rambled through its centuries of changing fortunes. Fight the plummeting temperature in such a spot as you soak it all in. Get your hands out of those coat pockets and let your frigid fingers curl around a cup of dark hot chocolate laced with Ecuadorian chilli as you contemplate the fact that you became a part of its checkered history, if only for a few wintry days one January! 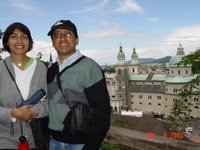 This entry was posted on April 12, 2006, in Austria, Bon Voyage!, Europe. Arriving in Vienna late at night, Llew, Chriselle and I made our home on Schulgasse, in a hundred-year old apartment building, with our friend Sabine Poelzl, Llew’s former Bank Austria colleague, who proved to be a very generous host. Awakening to bright sunshine the next morning was a treat and, somewhat unexpectedly, Vienna quite dazzled us all. Indeed, in the course of the next three days, we discovered the glory of the Hapsburgs in their splendid palaces, their exquisite churches, their vast treasury of royal jewels, clothing, arms and armor, their scintillating National Library and their lovely public gardens. To see the Hofburg Palace, seat of the mighty Austro-Hungarian empire in its entirety, would take months and so we contented ourselves with visiting the impressive Schartzkammer (Treasury) with its sacred relics including pieces of the True Cross, and a nail from the Crucifixion. After touring the stunning National Library, we walked through the enormous squares reminiscent of the majesty of Emperor Franz Joseph I and his beloved consort, Elizabeth (Sisi), and of powerful Empress Maria-Theresia whose fourteen children included Marie-Antoinette of “Let them eat cake” fame. Of course, we could not possibly leave Vienna without seeing the highlights of the Kuntshistoriches Museum, one of the worlds’ great art collections, where Rafael’s exquisite Madonna in the Meadow, works by Reubens, Rembrandt, Titian, Breughel, Durer, Lucius Cranach and particularly the portraits by Velasquez of the child Margarita-Teresa, the future wife of Leopold I, were entirely enchanting. Best of all, however, was the interior of the Museum itself whose grandeur is impossible to describe. Never has eye seen such extraordinary attention to detail in the sumptuous adornment of carvings, paintings, carpeting, etc. on the stunning central stairway, foyer and landings. Our visit to Vienna was made profoundly more enjoyable by the company of Ronald Sturm and his wife Karin and by Ronni’s brother Deiter, all long-time friends of ours. 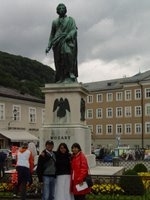 They went out of their way to give us a good time and to show us a side of Austria that only the locals can know. Ronni, a diplomat with the Austrian government, now on loan to the International Atomic Energy Commission, gave us a tour of the unique Vienna International Center. The previous evening, the Strums had taken us for a long walk through the vineyards of Nussdorf from where we had sweeping views of the Danube and of the neighboring country of Hungary (right). Ronni’s brother Deiter, a gynecologist and a one-time guide at the Schoenbrunn Palace gave us a private guided tour of this gorgeous Rococo palace with its immense collections of decorative arts. My favorite rooms were the Blue and White room, reminiscent of the fabric called Toile de Jouy and of the Indo-Persian room where the walls were decorated with Moghul miniature paintings inlaid with Chinese lacquer work. Taking the Grand Tour of the Palace left us gasping at the sheer wealth of Austro-Hungarian imperialism, its wide reach and its tremendous influence in an erstwhile era as seen in the Long Gallery and in the assortment of glorious furniture, wall-length paintings by Martin van Meytens, court painter to Maria-Theresia, and other treasures that cram the spacious rooms and galleries of this building. The Gloriette makes a lovely statement at the far end of the symmetrically laid-out formal gardens. After coffee and apple strudel in Café Dommayer near the Palace (left), Ronni, Karin and Deiter drove us to the south of Vienna through the most charming villages scattered all over with names like Perchtoldsdorf, and Modling until we arrived at the chic, upscale town of Baden with its casino, opera house, spas, gardens and quaint cobbled streets crammed with designer boutiques (see section on Baden). 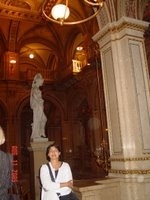 No visit to Vienna would be complete without a guided tour of its stately Staatsoper or Opera House. 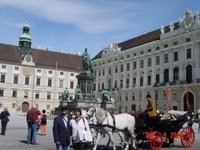 The tour took us into the lavish heart of one of Vienna’s most beloved buildings, decorated in Baroque excess with gilded moldings, graceful statuettes, glittering crystal chandeliers and solid marble staircases. Our visit backstage introduced us to the elaborate machinery underground that permits the changing of scenes and sets several times during the most spectacular of operas. Again, not surprisingly, Mozart is a particular favorite. In the same vicinity as the Opera House is the elegant Hotel Sacher where the famous Sachertorte was created. We brought one home as a souvenir and continued our rambles making sure to stop for hot chocolate and pastries at Demel’s, pastry-makers to the Hapsburgs. Austria’s konditorei (coffee houses) are worth visiting just for the sophistication of their settings, the style with which the most mouth watering pastries are displayed and presented and the quality of the service. Indeed, the crème schnitte that I ordered at Demel’s was worthy of the palates of royalty. For Chriselle, who declined to accompany us to Stephansdom as the Cathedral of St. Steven’s is called, as she had been there only four years ago, shopping in the Graben was more enticing as she found Europe’s young designers well represented on this snazzy pedestrian plaza. Llew and I, however, undertook the challenge of climbing all 350 steps up to the South Spire of the Gothic Basilica to get graphic views of Vienna as far away as the Belvedere Palace on a lovely sunny day. Later that day, we feasted on gigantic ice-cream sundaes at Café de L’Europe in the Graben before enjoying Austria’s best-known culinary invention, the Wiener Schnitzel at Grunspan, a restaurant to which Sabine, our wonderful hostess, took us and where we also tried Ottaringer beer for which Austria is renowned. Vienna’s beautiful broad boulevards, its superb public transport system especially the trams. The prospect of flying into Salzburg from London filled me with anticipation. I had hoped to receive a bird’s-eye view of the Salzkammergut as in the opening scene of The Sound of Music in which Julie Andrews as Maria races joyously singing, “The hills are alive with the sound of music”. Instead of which, we flew into Salzburg airport after darkness had fallen leaving me with few glimpses of the spectacular folds of the green-draped mountains. Despite the late hour, the area around the railway station still buzzed with tourist energy. We settled for the next two nights in the family run Pension Alderhof, a very charming place with painted wooden furniture and a short walk into Old Town. After a gigantic Austrian breakfast, we walked on a Sunday morning in a light drizzle, finding refuge at mass in the Church of St. Andras which was off the beaten tourist track and so devoid of crowds. Then, crossing one of the many bridges over the river Salzach, we arrived at Alte Markt, a busy market square where business for the day was just awakening. 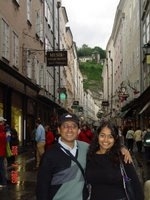 For the next couple of days, we allowed the magic of Salzburg to creep upon us. Despite the dreary weather (we actually had pea-size hailstones rain down upon us during an icy shower!) this musical city of Mozart and the Von Trapps, found its way into our hearts as we explored Getreidegasse (below left) and munched on a delicious giant chocolate covered soft pretzel filled with apricot jam—deeelicious! This famous shopping street with its curious wrought-iron signs adorning the shop fronts is the location of one of Mozart’s homes. The Salzburger Festspiele (Annual Salzburg Festival of Music) was on while Llew, Chriselle and I were visiting and the streets were filled to bursting with classical music-lovers looking for a bargain opera or a candlelight concert to enthrall them. Salzburg is a city to be met on foot and our walking tour took us into charming corners that came straight out of postcards. We posed for pictures by the famous Pegasus fountain that featured in The Sound of Music and in the courtyards of the many churches that give the city its distinctive skyline with is pointed steeples and its circular domes. Everywhere the genius of Austria’s Neo-Classical architect, Johann Bernhard Fischer von Erlach was plainly evident in the ornate Baroque altars with their layers of decorative embellishment—twisted marble pillars, gilded ceiling moldings, endless wall and dome frescoes by Johann Michael Rottmayr and curlicued stuccowork. As Llew put it, “Just when you think you have seen the most spectacular of the churches, you come upon yet another one that blows you right away”. Determined not to suffer sightseeing fatigue, we stopped at Café Tomaselli for coffee and pastries and had a chance to visit Cafe KondatereiFurst where the famous Mozartkugeln was created—chocolate and marzipan confections that melt in the mouth and are found all over this city in their distinctive golden wrappers with Amadeus’s portrait on them. People-watching in the sidewalk cafes is a very enjoyable activity and we did a fair share of it throughout our travels. Salzburg also presents beautiful aerial views from the Hohensalzburg Fortress that we visited through a ride on the speedy funicular train. The views of the Untersberg Mountain within whose shadows the city lies and the extended views of the Salzkammergut Region (Lake District) of Salzburg are also beautiful from this height.We took the stairs on our way down to the city, a move that’s high recommended for the totally amazing views it presents of the Dom (the city’s main cathedral), and the pretty spires of the churches. Finally, we ended our visit by exploring the Right Bank of the river, New Town, pausing to appreciate the beauty of the Mirabel Gardens and to gasp at the stunning Baroque marble staircase in the Mirabel Palace punctuated every so often with playful cherubs (right), a gift of Prince-Archbishop Wolf Dietrich to his mistress who bore him fourteen children. Now you know why they needed the Reformation! I had visited Salzburg twenty years previously and had taken the famous Sound of Music Tour at that time. Not surprisingly, the tour is till popular among foreign tourists though Salzburg locals seem oblivious to the hype that surrounds the shooting of the film in this enchanting location. Apart from the tour, other things hadn’t seemed to have changed at all. The weather, for one, showed little improvement in two decades—it was raining when I left Salzburg in 1987 and it was still raining when I returned the following millennium! Nothing dampens my joys in the city’s charms, however, and its views are best digested on the bridges that lead out to New Town. It was thrilling to be woken each morning to the peeling sounds of church bells in the many steeples that dot the skyscape and to munch on wurst at the several sausage stands around the city. On our way into Vienna, we made a detour into the fairy-tale village of Mondsee whose church featured in the scene where Maria weds Captain Von Trapp. 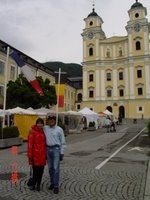 The pastel colored facades of the pretty houses on the main street and the masses of flowering annuals tumbling out of profuse window-boxes gave Mondsee a very special charm. 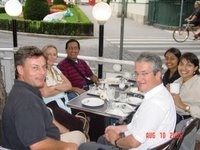 Then, just before we arrived in Vienna, we stopped off at St. Valentin to meet, after seventeen years, my former neighbor from Bombay from Bombay, Dinesh Marar, his wife Rosemary and their daughter Natalie, for dinner (below right). There is nothing I dislike about Austria. From the moment I first set eyes on the coutnry, more than twenty years ago, it has occupied a special place in my heart. Just about any corner of Austria could become the subject of a picture postcard or a landscape painting. Almost afraid, it seems ,of asserting its identity in the presence of dominant Germany, its next door neighbor, Austria has been content to take the back seat. Yet, droves of visitors leave bewitched by its combination of natural beauty and unique contributions to civilization. I mean what’s not to love about Mozart’s “Eine Klein Natchmusik” or a slice of cripsy apfel streudel? And then there’s that legendary Viennese Roast Coffee…and the schnitzel. 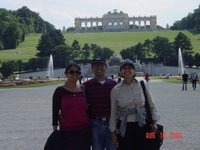 And the romanticism of the Von Trapp Family Singers and ….there’s so much more to Austria. I wanted to share it all with Llew and Chriselle. It has helped that Llew’s own career in Banking long associated him with the country through his job with Creditanstalt which later became Bank Austria. 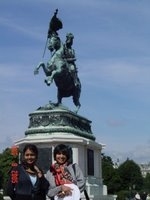 It made us friends who live in Vienna and frequently invited us to visit the country in their company. 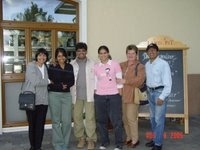 My former neighbor from Bombay, Dinesh Marar, had married an Austrian and had made the country his home. 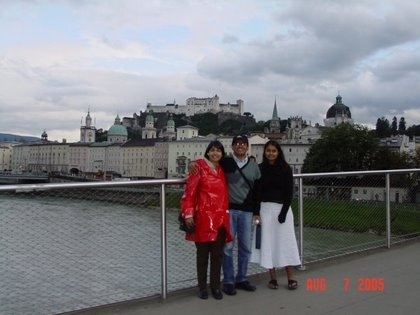 Through Sabine Maringer Poelz and my old friends of over twenty years, Ronald Sturm, his wife Karin and his brother Deiter, we saw Austria through familiar eyes when we visited the country in the summer of 2005 on a tour of Eastern Europe. Follow us now on our travels around Austria. 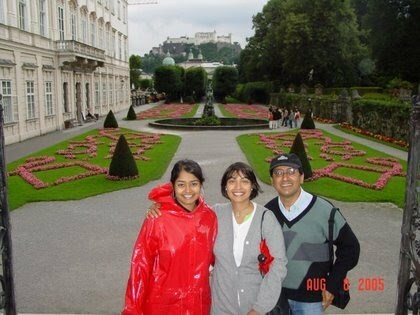 Let us take you to Salzburg, a city in which my maternal grandmother Valerie Marcks had lived in the years between the two World Wars. 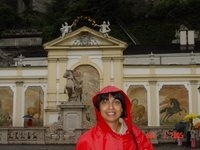 She often told me of the beauty of Salzburg when I was a little girl. I felt as if I was walking in her footsteps when I arrived in the city as a backpacker in 1987. Almost twenty years later, I thought of her again when I walked the same streets, this time in the company of Llew and Chriselle who also fell in love with the city. Then stay close behind us in Vienna, magnificent capital city of the Hapsburgs, as we see some of the world’s greatest art treasures. In the gracious spa town of Baden, we shall tread upon cobbled streets that carry strong sulphur scents. We returned home with a ton of evocative photographs, a special wooden box containing the famous Sachertorte and memories of a warm and friendly people who generously shared the bounty of their land with us. We’re sure you will love Austria too.